Crispy, light and airy – the bag really speaks the truth. For those of you who love El’s Gluten-Free Medleys, you’ll be excited to know that their bagel chips now come as a stand-alone product. 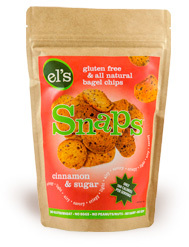 They recently sent me some of the Cinnamon & Sugar Snaps bagel chips to try. They really aren’t very sweet, despite the sugar part of the name(there’s definitely not sugar sitting on the bagel chips. The molasses in the bagels gives a deeper taste to the cinnamon with a hint of the exotic. These little snacks are completely crispy, free of the top 8 allergens, have 100 calories per serving (if you can put the bag down), and even have some fiber. El’s Snaps also come in Simply Sea Salt and Garlic & Herbs. As for El herself, she is a wonderfully nice woman. I met her in person at a gluten-free food fair awhile back and have seen her at a few since. She makes me smile just being around her. If you haven’t been introduced to the medleys, you can check out my original post and one on some different flavors. You may find a new favorite snack. This entry was posted in Reviews and tagged Braden-friendly, dairy-free, egg-free, peanut-free, soy-free, tree nut-free. Bookmark the permalink. I recently had the garlic and herb bagel chips last week… they are amazing ! I just found the answer to wonderful gluten free croutons! Excellent! When we demo our products we suggest them as a use as croutons on salad or in soup. Plus they’re only 100 calories or less per serving. Where, in the Portland, Oregon area can I buy them?